We were fortunate enough to have clear skies this past weekend and I managed to do some narrowband imaging from my back yard in Granger, Ohio. 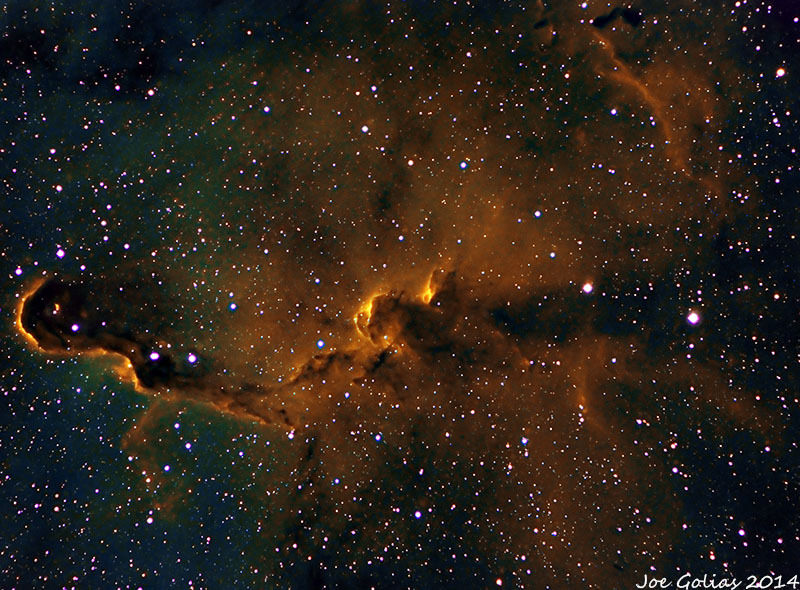 I’d like to share with everyone one of my latest CCD images taken of the Elephant trunk nebula IC 1396 located in the constellation of Cepheus. I often wonder why I bother traveling great distances to dark sky sites like Texas and Florida when I can get results like this from my back yard in Ohio! Imaging details: Telescope: Takahashi TOA 150 Refractor. Camera: SBIG ST8300M with self-guiding filter wheel. Mount: Losmandy: G-11. Exposure times in narrowband: 4 hours SII filter with 20-min. sub exposures, 4 hours OIII filter with 20-min. sub exposures, 4 hours HA filter with 20-min. sub exposures. Location: Granger, Ohio. Processed in MaxIm DL, Images Plus, Pixinsight, and Photoshop. Final RGB combination was converted using the Hubble color palette, HST. CAA Member Joe Golias is (obviously) an expert astro-imager and is owner of Astrozap, a Cleveland-area company that produces astronomy accessories. This entry was posted in Uncategorized and tagged astrophoto, golias, member photographs, nebula, northeast ohio, northeastern ohio, ohio, photograph. Bookmark the permalink.